With buttery layers of crumbly shortbread, sticky caramel and chocolate, these little treats really hit the jackpot! They’re a real sweet treat to delight your family, and they’re really easy to make, too. Our tasty caramel shortbread recipe makes 16 servings – so there’s plenty to share, although it won’t be around for long! 1. Put the crushed biscuit into a bowl with the melted butter. Mix it together thoroughly, then press the mixture into the base of your tin. Chill for ten minutes. 2. Heat the sugar and remaining butter in a non-stick pan gently, stirring, until melted. Add the Carnation condensed milk and bring to a rapid boil, stirring continuously. Cook for a minute or so or until the filling has thickened. Pour the caramel over the base. Cool, then chill until set. 3. Melt the chocolate in separate bowls. Pour the dark chocolate over the caramel and then add spoonfuls of the melted white chocolate. Swirl together with a spoon for a marbled effect. 4. Chill until set. Remove from the tin and cut into squares. 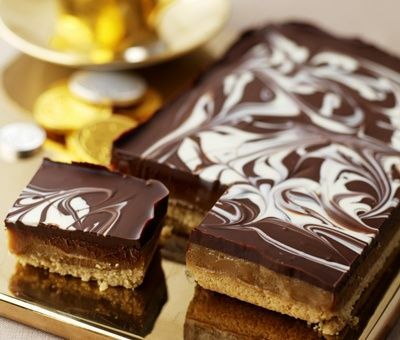 This millionaire’s shortbread recipe can be kept for up to two weeks – just put in an airtight container and store in the fridge! Recipe contains milk, gluten and soya. Hi Jayne, what a great idea. Thanks for sharing! Can I use milk choclate instead of dark chocolate for the millionaires shortbread. Hello, yes this recipe could be made with milk chocolate. For best results marbling the chocolate ensure the 2 melted chocolates are at a similar temperature when swirling. Hello Naomi, we are happy to hear that you enjoyed the Millionaire's Shortbread. Hello Marie, ensure that the caramel is completely chilled before pouring over the melted chocolate. The caramel should be firm enough to cut through the chocolate but if you would like a softer set try melting the chocolate with a little butter. Great simple recipe - don't know why I haven't made this before! I only had 200g of homemade shortbread which was actually enough as I don't like a thick base. Like others I boiled the caramel for a few minutes which resulted in a lovely thick chewy centre and I just melted one 100g bar of milk Green and Blacks on top which was enough. Thanks to the other cooks for their tips! Hello Angela, sounds like very successful Millionaire's Shortbread! We love hearing all the baking stories and tips. Hello there, how long will this recipe last for? I'm looking for recipes that have a longer shelf life of around 2/3 weeks? Hello Zoe, we recommend keeping this recipe for up to 5 days in an air tight container. I want to try this recipe but would like to know if I can use the tins of caramel condensed milk in place of the dark sugar and condensed milk? Hello Sharon, Carnation Caramel is a fantastic shortcut for delicious banoffee pie. However the topping for Millionaire's Shortbread needs to be thicker, like a soft fudge. For this it is worth taking a little more time and making the caramel filling from Carnation Condensed Milk. Hello Penny, Millionaires' Shortbread is a classic favourite in the Carnation kitchen. It sounds like your second batch just needed a little longer on the hob before you pour it over the biscuit. The Carnation Caramel is a wonderful shortcut for recipes like banoffee pie but it is a little soft for Millionaires'. It is worth spending a little more time to create this delicious treat. Hello Suz, yes you are correct, the 55g amount of butter is added to the biscuits. Happy baking! Follow the tips for thicker caramel and try replacing the shortbread base with Ginger biscuits with grated ginger or powdered ginger mixed in. This is a definite winner! I have made this twice now. It's so easy to make and quite possibly the nicest one I have tasted, I am totally addicted ! How delicious are these? Really impressed how good they taste! I make this a lot and it's a big hit at work and at home. I find that you need to really press the biscuit base down hard to make it keep shape, I always cook the caramel longer on the boil to give a lovely thick, chewy caramel (constant stirring though), then turn heat down and carry on stirring it in the warm pan for another five mins before transferring it onto the biscuit base, cool and then chill. I make a triple choc marble using equal amounts of dark plain chocolate, milk chocolate and white chocolate approx. 100 - 120grams of each, makes a lovely marble effect and tastes great. Top tip - made this today and a quick way of crushing the shortbread is to grate it! Make a gluten free shortbread 200gr polenta flour, 200gr ground almonds. 200 gr butter, 200 gr caster sugar. Prepare in the same way as the standard shortbread. I made this early but with Dark Muscovado Sugar and Evaporated Milk instead. It took a while for the caramel to harden and the taste was a lot different. My partner loves them but I think it is going to take another bite to see whether its for me or not. Also, I used unsalted butter but I reckon that Stork would've given the biscuit base a more stable and nicer texture. Made this using milk chocolate as not a fan of dark!..easy to follow recipe and the outcome was delicious. Can you use salted butter for this recipe? Hi Cheyanne, we recommend unsalted butter for most recipes but if you have salted to use it will work just as well. Hi,can I use dermerara sugar instead or is brown sugar best. Hi Suzy Demerara will work in this recipe but you will get a lighter caramel and a less intense flavour. We love this recipe as it is and it never lasts long but you won't have problems with a lighter sugar. First time I have ever made millionare shortbread, followed the instructions and was perfect, very impressed, defo a favourite of mine now! Help I made this and the caramel separated from the butter and went lumpy! What am I going wrong? Hi Charlene, next time bring the mixture to the boil slowly stirring all the time. Then boil for a minute before pouring over the base. The mixture should stay together. Hi Carina, you've got it. It is important to boil the caramel for at least a minute. Don't worry about it burning as long as you keep stirring it it wont catch. I have a really good recipe for millionaires, but always cook the caramel for exactly 4 minutes when it starts to bubble. Works every time! Can I use carnation light for this? As it's what I have in at the moment. Hi Irene, Yes condensed milk light will work beautifully in the recipe. i tried to make this for the first time today, however how long do i leave the caramel to set?? I left it in the fridge for approx 2 hours and it seemed fine, i melted the chocolate and let it cool and poured over the caramel, then put in the fridge for another 2 hrs. However i just went to cut it up and the caramel is all squishy...not very nice texture in the mouth lol. Hi Ashley , sorry to hear that your shortbread misbehaved. It really is a tasty treat when it works. Next time try boiling the mixture for a little longer then make sure the caramel is completely set before topping with chocolate. 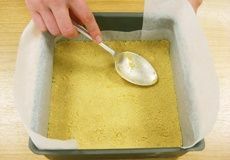 Hi Fiona, Shortbread has a different crumble and so will use less butter to bind. If you use digestives then try 250g biscuits to 100g melted butter for a better holding base. My caramel mixture is more of a cream colour than a caramel one. Where have I gone wrong? <b>Carnation says:</b><br> Hi Rebecca, the most likely reason for a lighter caramel is the type of sugar you have used. The darker the sugar the darker the caramel will be. Demerara or light brown sugar will not give you as dark a caramel as Dark brown. I'm sure it was still delicious. I receive loads of compliments anytime I make this. Although I have had to stop making this so regularly as my boyfriend and I were both putting on so much weight! Scrumptious and incredibly easy! I love making this. Instead of making the base with crushed biscuit, I make my own shortbread and it turns out just as well! Can I make these using caramel condensed milk instead of using regular condensed milk and brown sugar? Hi Sue, whilst the caramel is delicious and very easy you get a better result if you follow the recipe. The sugar and carnation condensed milk makes a lovely filling that cuts beautifully. My 13yr old son made this at the weekend. It was delicious! Just one problem.....he used carnation caramel which hasn't set....very gooey!! Can't be cut into pieces!! This is a big shame!! What can be done to overcome this...it has put me off buying carnation caramel again!! I made this but the caramel has all run out :( cannot understand what I did wrong. Hi Debbie, it sounds like the caramel needed to cook for a bit longer. Once it come to a rapid boil let it thicken before pouring onto the biscuits. This is the 3rd time I've made this and it is a real winner with my family. Taste and looks great. Hi Lisa, this recipe is still a favourite in the Carnation kitchen. Glad you enjoyed it! Hi Kara, sounds wonderfully luxurious! This is truly georgeous, made it for a family gathering and everyone loved it, will make again. Having followed this recipe I have now made these delicious Caramel Slices and my hubby loves them. They are indeed a real treat! Hi Melissa, for the wonderful fudgy consistency we find it is best to use condensed milk. Hi Carol, sorry to hear your millionaires caused you trouble. The caramel needs to be cooked at a high heat until it thickens. Make sure you stir continuously so that it doesn't catch. This should ensure that next time they are perfect! Hi Lorraine, yes in baking sweet goods we always use unsalted butter. Just made this using digestive biscuits and light brown sugar and its yummy! Have made this recipe several times now and absolutely love it! I have just discovered your website and think it's brilliant. Hi Elizabeth, for this recipe you just need to bring the mixture up to boiling and as soon as it is it should be hot enough. If you have plenty of boiling bubbles coming up then take it off the heat. We don't normally recommend a specific temperature but it would be about 112C. Hiya, how would I adapt this recipe for a 23cm brownie tin? Hi Louise, you could just have a slightly flatter version and just use the recipe as it is. If you like a thicker biscuit base though - do one and a half times the base and then use the rest of the quantities the same and this should work fine! Happy baking! I've made these a few times and they are just fabulous, go down a treat! Can the filling i.e. the milk, butter, sugar mix be frozen? Hi Keith, yes in fact if you want to you can freeze a completed batch of millionaires shortbread with the chocolate top! Keeps for about a month. I make these every time theres a special event as its so easy and literally takes less than 20 minutes to make. Also the pudcasts make it a whole lot easier, love the carnation website! made these today and the are scrummy, easy to make, caramel was a bit soft but still tasted fab. i used chocolate digestive biscuits instead of shortbread biscuits and it turned out much more yummier than i had expected! Hi Mohammad, if the caramel is not thick then you will need to boil it for a little longer - test it by dropping a little into cold water - it should form a soft ball. If the chocolate is too hard - try a mixture of milk and dark chocolate or add 1tsp vegetable oil into the melted chocolate before spreading. Score the top before the chocolate sets hard and use a hot knife to cut it! Hi Chris, if you use just sugar it will set to a hard caramel which will be very brittle. The condensed milk will give you a lovely chewy, smooth and creamy caramel layer which is just divine! is it possible to make a Gluten free version of this recipe? Hi Clare, yes it is - look out for gluten free shortbread or other biscuits and replace these weight for weight in the recipe. These can be found in larger supermarkets and health food shops. Add enough melted butter to the crushed biscuits so that the mixture feels like slightly wet sand. You may need a little more than for normal shortbread biscuits. Happy Baking! I have used your tinned caramel but it won't set! been in fridge for over an hour now and still no change. Help!! 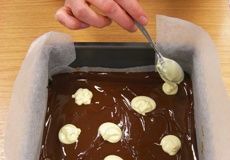 Hi Catherine, the caramel is too soft for this recipe - so we always recommend using condensed milk which makes a more chewy and dense caramel which can stand up against the hard chocolate and biscuit layers. How about breaking up your Carnation Caramel version and mixing it through ice cream for millionaires ice cream instead? Soften the ice cream first, beat through the millionaires bits then re-freeze for 2 hours. 55g caster sugar and 115g unsalted butter, cut into small pieces. Whizz these ingredients together in a food processor until they form breadcrumbs then press firmly into the tin, chill for 20 minutes then bake for 25-30 minutes until just golden, then continue with the recipe. im in the process of making this and ive had to use choc digestives, and milkchocolate.... heh is this bad? Hi Mawl, no it sounds like a lovely twist on the original recipe! Let us know how they turn out?! Just made this...going to taste it tomorrow! Can't wait :) Tried making this from another recipe last night and the crust was too crumbly and the toffee was hard as rock! But I think this one is a keeper! Used 200g digestives and 100g butter Thanks a lot! Hi Shauna! Yippee glad you enjoyed making it - wonder how many new friends you made with it?! could i use the tinned caramel instead of the milk??? Hi Mawl, we find the condensed milk version better as it sets more solidly and is easier to cut. Our caramel is softer and we think better for Banoffee! I made this cake once and will do it again because is delicious :X. Everybody loves it. Just made this didn't have enough shorbread biscuits so added some ameretti biscuits ! Have made this recipe soooo many times and have absolutely loved it the first time i made it my dad ate them all naughty naughty, anyways i have made it many a time as i was saying before and i take it to school and my teachers have asked for the recipe loads of times its a really good recipe thankyou so so so much for coming up with it!!! :) me an my mum are making it AGAIN right now for halloween tomorrow my friends all love it. Made this today but with some changes as I didn't have all the ingredients but wanted to use half a tin of condensed milk. Used digestive biscuits instead of shortbread and lightbrown sugar instead of dark brown, and halved all the ingredients. Lovely taste and so easy to make - base a little bit crumbly, but still delicious. Just made this today and is going down a treat. I found that the chill time for mine was much longer than 20mins but is so worth it. I used ready to pour Caramel thinking set time would be much quicker but it's not the case :D Really loved doing it but eating is is heaven thank you! Next time I think I will put in the freezer for the 20mins and see if that's any better. Hi Emma, oh dear sorry that it didn't work out for you : (- sometimes the butter content in the biscuits vary so this can make the base a little crumbly. Would you share your shortbread recipe with us? When I made the toffee it was very soft and not really very caramel like in spite of cooking it for about 3 minutes. Hi Joyce, we like a soft creamy caramel but if you like it more chewy and solid then use half caster sugar and half brown sugar and boil for 5 minutes. This should make the caramel really thick! This is delicious! If you have a sweet tooth this is the cake for you! I've made this 2wks in a row. Very easy to make and only lasts 3 days in our house! Love it!! 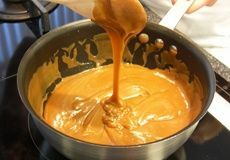 Hi Emily, for making the caramel the pan method is the best - it needs regular stirring and we wouldn't want your microwave to end up with sticky caramel bubbling over in it! Happy cooking! I made this with carnation evaporated milk & it tasted a lot a lot better. everyone loved it, thank-you for the recipe! Hi Betty, we prefer using condensed milk in our millionaires as it makes a thicker caramel. Our Carnation Caramel is soft and creamy and is better for our gorgeous banoffee pie! I agree, there should be more butter in the base for this. I use 200g digestives and 100g butter. Just add more butter Jenny Wren, my grandchildren can't eat this quick enough! 55g(2oz) Is NOT enough melted butter to hold crushed biscuit crumbs together. I have tried this recipe twice and a lot of the base has remained in the tin! I would not recommend a substitute for butter in this recipe, as even a good quality alternative such as clover seems to separate when making the caramel. I wasted a lot of expensive ingredients. Millionaire’s Shortbread Recipe is rated 4.9 out of 5 by 62. Rated 5 out of 5 by Daffodil Dai from Instant Indulgent Success! I thought I’d try this recipe for my stepson with very sweet tooth! He absolutely loved it! His girlfriend (who doesn’t like caramel) tried it reluctantly but loved it too! It was easy to make and with the swirl of white chocolate it looked very professional! For a really special occasion I think I’ll try adding a sprinkle of gold flakes on the chocolate! My only slight niggle was that I found cutting it into squares a bit tricky even with a hot knife. But another time I will try cutting a trip room temperature rather than straight from the fridge. Fabulous recipe and MUCH easier to make than other recipes I’ve used with better results! Thank you Carnation. Rated 5 out of 5 by Emma Foster from Caramel texture can be changed... I’ve tried this several times- start by adding baking parchment that overlaps so the chilled traybake can be lifted out in tact after chilling. The longer the caramel is stirred for over a medium heat (5mins+) the harder the caramel will set, so less time means a less chewy bite. This is a great recipe- I speed up the chill times by freezing in between each layer. Serve at room temp after 20 minutes in the freezer after the chocolate layer!! Rated 5 out of 5 by Sarahnmax from Time consuming, but absolutely worth it!! This is my husband's favourite treat, so I made them as a surprise. Allow lots of time for cooling between layers. Absolutely delicious! Rated 5 out of 5 by Uzzie from Extremely moreish! Made these after a long time and they're as good as I remember! The caramel was gorgeous. Made it with milk chocolate rather than dark as the kids prefer it. They were fighting over the last piece! The only change I would make next time is to make a thicker layer of shortbread just because I like it that way. Will definitely be making it again!